We have a lil Bichon Frise. Her name is Jenna and she is 8 mos old. She is a complete joy in our lives. 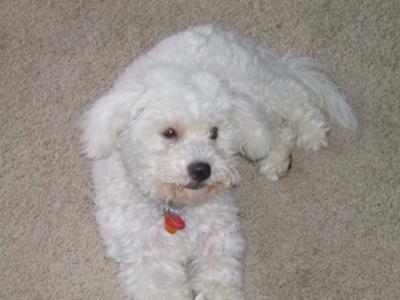 I did a lot of research and thinking before finally deciding on a Bichon but I could not be happier with my choice. She at 8 mos old has become a huge part of our family. We have socialized her very well with children and other animals. From day one I worked hard on her housebreaking. I would set my alarm in the night to take her out every couple of hours. She gets taken out very regularly. Here I can have her out for a half hour in the am and she will do her business. I praise her and give her a treat but yet after being inside for less than maybe 15 mins she poops in the hallway, always in the hallway. We are besides ourselves as to what to do. I am proud of the way I am raising Jenna as I did read a lot about the Bichon Frise dog breed before taking her in. But I am baffled. She is always pooping in the house no matter what we do. Do you have any suggestions or answers as to why she is doing this, will she outgrow it, what can we do differently? She knows she did wrong because when I go to clean it up she goes straight to her cage knowing she was wrong. We praise her well when she does well we do the treats. We take her for walks. We take her out regularly. What more can we do about puppy potty training or is it that she is still young? Hope you can help because we love her so much. She is my Babygurl. What you are experiencing is not unusual when house training a puppy. Especially a Bichon Frise puppy. They are independent thinkers and can be very difficult when it comes to puppy potty training. One reason Jenna may be going back to the same spot in the hallway to go potty is the smell. Try cleaning the area with a vinegar and water solution or a special enzyme cleaner to eliminate the dog potty odor. You can usually find the enzyme cleaner at a pet store or larger grocery store. https://www.dogs-and-dog-advice.com/bichon-frise/. This page will help you learn a bit more about your dog breed and (hopefully) give you some encouragement when it comes to potty training. https://www.dogs-and-dog-advice.com/house-training-a-puppy/. This page will give you some specific house training tips. Review the instructions and be diligent. There are also links to more dog training tips in the right column of the page on house training a puppy. Your Bichon Frise is very cute. Keep working at it. You can do it!